Relevant webcasts from industry leaders on assurance, governance and security topics. Also, find need to know information on ISACA certifications and research projects. 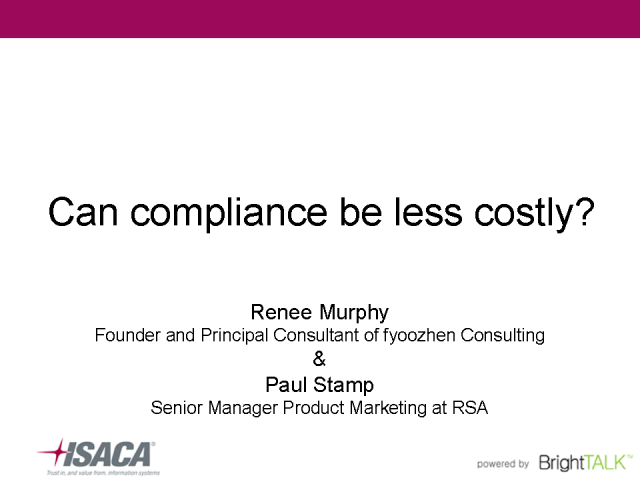 Can compliance be less costly? Because it cuts across business functions, systems and processes, compliance is one of the most complex and costly challenges facing IT functions. Is your organization, like so many, struggling with reactive, fragmented compliance projects, non-integrated technology investments, manual processes and duplicated effort? In this session Renee Murphy, Founder and Principal Consultant of fyoozhen Consulting & Paul Stamp, Senior Product Marketing Manager at RSA, The Security Division of EMC, will focus on real examples of organizations that are consistently and cost-effectively enforcing IT compliance across multiple geographies and business lines. We'll also show you how doing so helps them minimize security vulnerabilities and frees them from time-consuming manual processes to spend more time adding value to their businesses. This session will deliver you an introduction the ISACA COBIT, VALIT and RISK IT frameworks and how to commence a practical GRC journey using them together to provide effective governance. This session will focus on the new ISACA guide for implementing and continuing improving the Governance of IT within organizations. It will address the positioning of IT governance within the enterprise governance framework and how important it is to create the right environment for successful governance of IT. It will introduce the IT Governance lifecycle and discuss implementing the lifecycle, pain points, trigger events and challenges to success. Also, covered will be enabling change and managing the program. Finally, it will discuss the use of guidance such as CobiT, Val IT and Risk IT for achieving good practices in IT governance. It’s not easy to keep an enterprise successful and secure these days. Organisations all over the world are faced with a host of challenges: an unsteady economy, growing competition, volatile global markets, shrinking budgets, and consumer uncertainty. Added to that, the growing threats that can easily outwit point solutions with a combination of web 2.0 technologies, encryption, sophisticated spam techniques and phishing attacks. John will take us through McAfee's Global Threat Management technologies which can instantly detect and block multifaceted attacks that attempt to enter your network, simplifying the process for your organisation. He will also discuss some critical requirements to consider as you look at ways to reduce costs and streamline security management processes through a consolidated network portfolio, simplified administration and centralised management via ePO. This is a introduction to Cloud and Virtual environments for ISACA members. Join Ars Technica/Sun/Intel as they give an overview Cloud Computing and Virtualization and then an ISACA speaker will discuss the GRC and security management considerations in Cloud and Virtual environments. Welcome to this ISACA event, sponsored by SonicWALL. The speakers for this live webcast will be discussing how network and application usage is dramatically changing the way networks are designed, managed and protected. Bandwidth is increasing and users are becoming more technically savvy as they strive for greater productivity. At the same time, the growth of insecure Web 2.0, Software as a Service (SaaS), Service Oriented Architecture (SOA), social networking, Peer-to-Peer (P2P) applications and streaming media has increased the need for greater traffic inspection. Firewall-evasive techniques, convergent online information and port-hopping have added new opportunities for the spread of malicious content and code. Traditional approaches to network infrastructure are failing to meet the combined demand for unrestricted throughput, deep security and granular control. In most cases, the need for throughput has won out, and security, control and employee productivity have been compromised. -How to manage application diversity and bandwidth growth. -How to regain control without compromising network performance. This presentation will provide a brief synopsis of the federal initiatives designed to enhance the security of the US federal information systems and the critical role NIST (National Institute of Standards and Technology) plays in setting standards designed to achieve FISMA compliance. An overview of IT Governance focus areas and control cycles. Learn more about ISACA's industry leading certification in the governance of Enterprise IT.